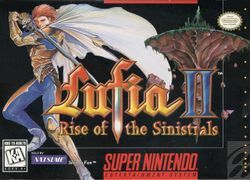 Lufia II: Rise of the Sinistrals, known as Estpolis Denki II (エストポリス伝記II, Estpolis Denki II? officially translated as Biography of Estpolis II) in Japan, and as simply Lufia in Europe and Australia, is a RPG with puzzle elements developed by Neverland and published in Japan in 1995 by Taito, and in North America and Europe in 1996 by Natsume and Nintendo respectively, for the SNES. The game is a prequel to Lufia & the Fortress of Doom. It follows the story of the first main character's ancestor, Maxim, and explains the origins of the war between mankind and a group of gods called the Sinistrals. Lufia II made a number of changes from the first game. Dungeons no longer have random encounters and there are hundreds of puzzles throughout the game, ranging from simple to extremely challenging. It also introduced new skills, such as a variety of weapons that could be used to stun monsters or solve puzzles, and IP attacks. In 2009, Square Enix announced a re-imagining of the original game titled Lufia: Curse of the Sinistrals. The story is centered around the hero Maxim, a swordsman from the town of Elcid who is born with a natural ability to fight and is destined to destroy the Sinistrals. Throughout his journey, he meets other warriors who are able to confront the Sinistrals as well. The game is a prequel to Lufia & the Fortress of Doom, set ninety-nine years before it, telling the story of how the Sinistrals first appeared in the world and the battles fought against them. This page was last edited on 28 February 2016, at 17:51.